Gov. Jerry Brown is no Billy Beane. Coaching a bottom-dwelling state, Brown is continuing to dole out big money for policies that are past their prime and failing to perform. California remains at the bottom of the education, business-friendliness and government efficiency rankings — and at the top of taxation, regulation and fleeing residents rankings. Beane, whose Oakland A’s are once again in the Major League playoffs, realized in 2002 he didn’t have enough money to put a team together the old fashioned way. So, as recounted in Michael Lewis’s best-seller, “Moneyball,” he signed undervalued players other teams overlooked. Each was smartly chosen for on-base percentage, scoring runs, or less measurable qualities like stepping up when the chips are down. Other managers thought Beane was either desperate, insane or both, but the rag-tag team of forgotten players he assembled became winners. The book was made into a 2011 movie starring Brad Pitt. Beane had the ability to see in baseball’s raft of statistics what other managers didn’t. Brown is surrounded by statistics on how California’s various players — agriculture, business, local government, state bureaucracies, pension funds — are performing compared to other states, but he can’t seem to read them. Instead of pursuing government policies that are the parallel of Beane’s brilliant recruiting, he’s doing the governmental counterpart of the Yankees shelling out $18.7 million (prorated down from a contracted $28 million) to get pitcher Roger Clemens back from the Houston Astros in 2007. Clemens made $1 million a start that year, and came to define “worst trade ever” to many baseball buffs by turning in a lackluster 6-6 season. Proposition 30 is Brown’s Clemens, a high-cost, past-its-prime approach to government that he hopes will lift California out of the cellar. Like Clemens, it costs a lot, with sales and income tax increases of as much as $50 billion over the next seven years. Like Clemens, it too has a strong arm, in this case strong-arming Californians with its threat that if they don’t pay up, the teacher dies. And just like Clemens showed the Yankees, there’s no guarantee it will work as promised. 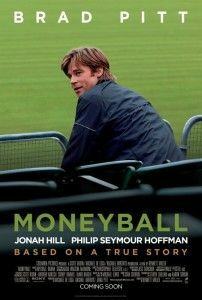 Should Prop 30 fail in November, Brown will have a chance to start playing Moneyball. Here are some ideas for the manager of the major league Sacramento Spenders. Schools. Schools are the state’s single biggest expense, receiving 43 percent of the General Fund. Half of this largess goes to administrative overhead, because it takes a lot of administrators and $400 million a year to fulfill all the mandates, reports and busy work imposed on school districts by Sacramento. In contrast, just 20 percent of Connecticut’s education budget goes to administrative overhead. California ranks No. 46 in the most recent “best-educated state” rankings, while Connecticut comes in second. Then there’s the problem that our teachers are the highest paid in the nation, despite California’s tragically poor education outcomes. The California Teachers Association, which gave almost $50 million to Brown’s 2010 gubernatorial campaign and has paid out $6.3 million to support Prop 30, does all it can to keep salaries high and performance-based pay a nonstarter. Moneyball in education would see the elimination of most of state-imposed mandates on public schools, so we could stop paying for thousands of high-priced school administrators. Then, Brown could support a ballot initiative requiring performance-based pay for teachers, and rail against the devious CTA advertising that would attack it. Brown would never do this, of course, but a Governor Billy Beane would. Pensions. 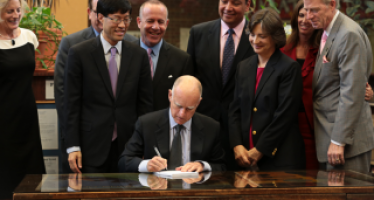 The real reason Brown needs Proposition 30 is to shovel money into the $250 billion to $500 billion hole of unfunded state employee pension liabilities. Brown needs to start managing this problem Moneyball-style. He will get nowhere as long as he dodges dealing with the contracts of existing employees, as he has to date. That’s where the real liability is, so he has to force the rewriting of those contracts, especially when retroactive increases were given, or unions won increases that were completely out of the norm of private sector increases. 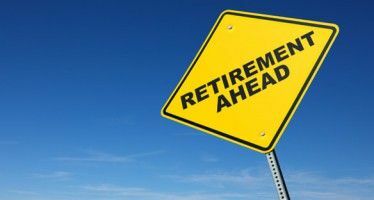 Costly add-ons, like life-time health insurance for agency directors, need to be prohibited retroactively. This won’t be easy, but in “Crazifornia,” I make the case that many public employee contracts can be voided because management negotiators were city administrative employees who would benefit from rank-and-file salary and benefit increases when their own contracts were renewed. Brown should seek to have thousands of these sorts of contracts across the state declared null and void by claiming they are the fruit of criminal racketeering under the federal Racketeer Influenced and Corruption Act. Brown would never do this, of course, but a Gov. Billy Beane would. Brown would never attack spending in this way, nor would he do many other smart Moneyball approaches to fixing our lumbering disaster of a state. Which is why his governorship will ultimately fail. Prop 30 is going down, no doubt about it. Ptrop 30 is a country mile behind 30 and has NO chance of passing. 0 for 13 ™ in his famous predictions. Last year he predicted huge losses in the cops pension roll back cases in the OC– Of course he lost all three times! and other than admitting he lost, he has no explanation! Poodle….if #30 goes down the poor little kids in your trailer park will come to you…..no lunches…no two- three weeks of vital learning…all your fault! #30 6 billion is pin money…..will pass without a hitch…. Rotti= 141 -0 on Nov 6! “without a hitch”! Well said U Haul!